(MARINA) This pasta is my very own creation. My inspiration to make this bowl was my mom. 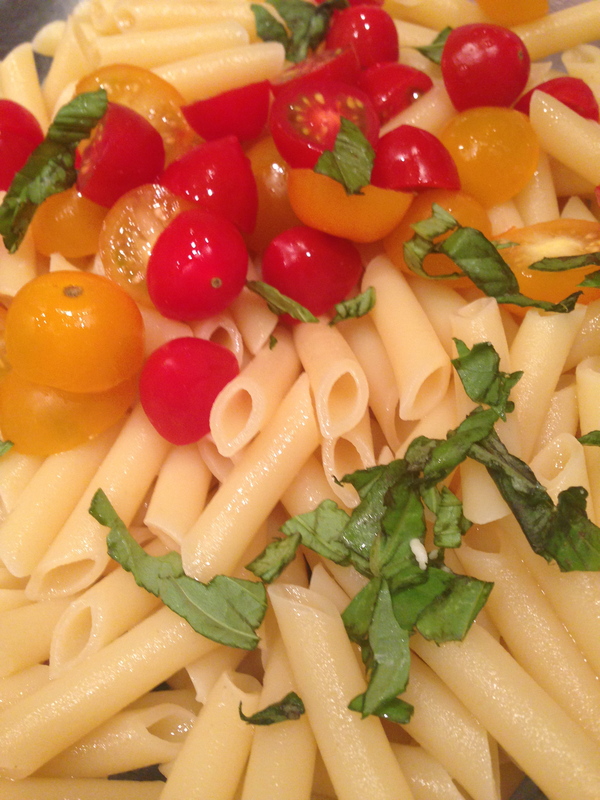 She made Caprese Salad and I said, “I need to add something.” A light bulb went off in my head, and I thought, “why don’t I add some pasta?” That’s exactly what I did and this dish was born. The trick to getting everything covered with the dressing is to layer the ingredients, then toss them together. 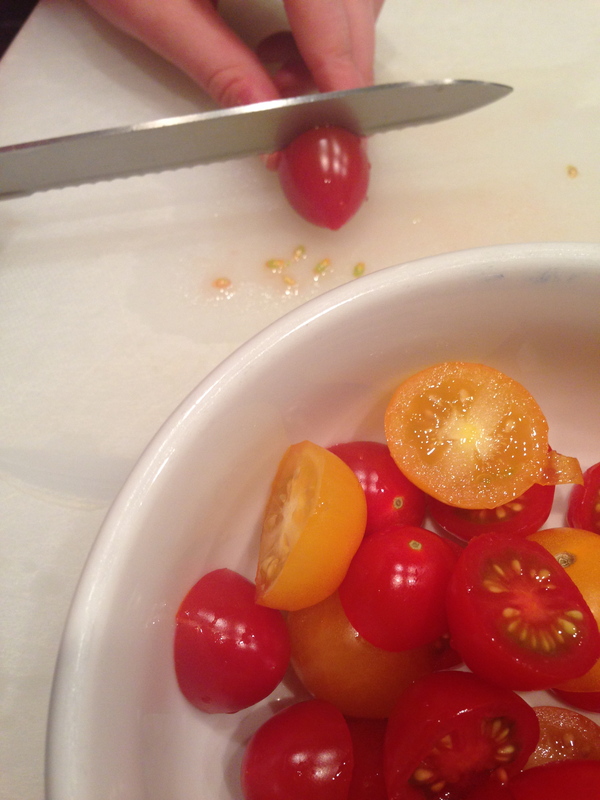 First, you cut the tomatoes in half. I like to use different colored tomatoes. 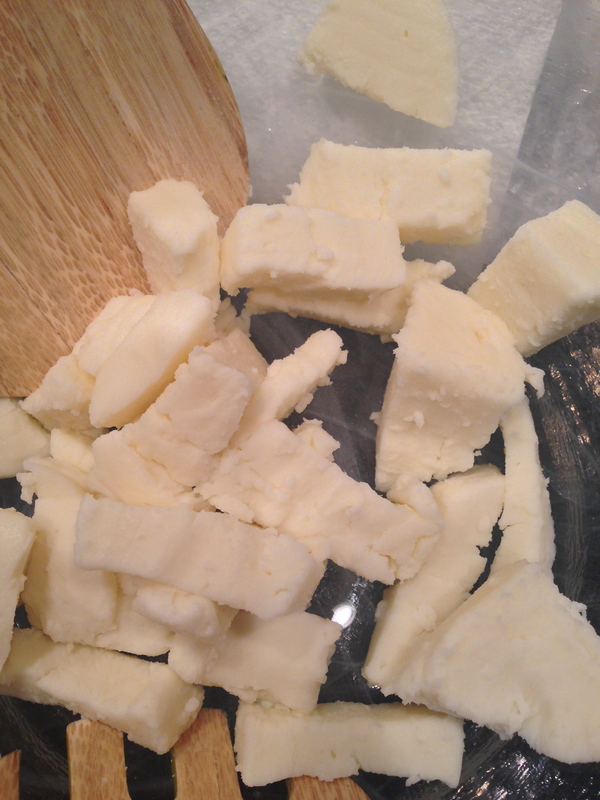 Then chop the fresh mozzarella and basil. 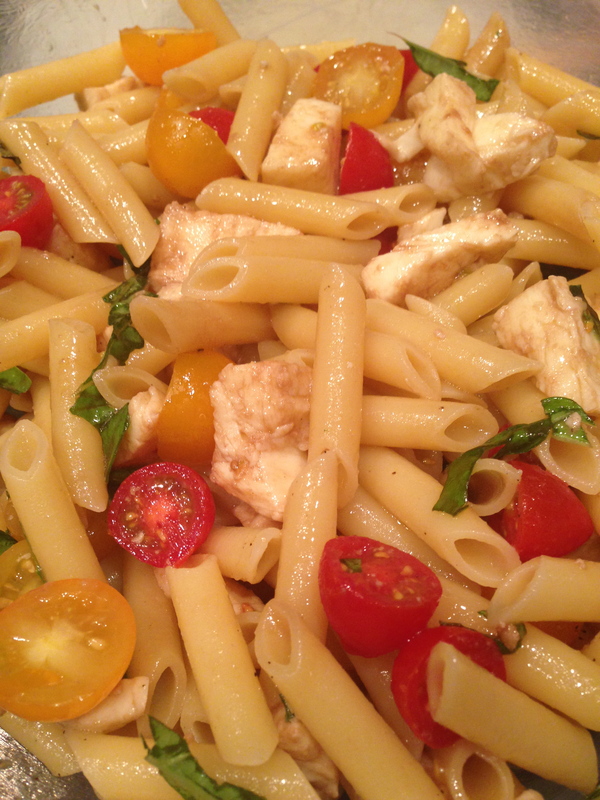 Put the tomatoes, basil, and mozzarella in a bowl and mix them up with balsamic vinegar and olive oil. Put half of this mixture in a large serving bowl. Next you put pasta on top. Repeat this with the rest of the tomato mixture, then the rest of the pasta. Drizzle more vinegar and oil on top and finally, toss it all up. The heat of the pasta just runs over the other elements of the dish and barely heats up the cheese and tomatoes: not too cold, not too hot, just right! Cook the pasta according to package directions. 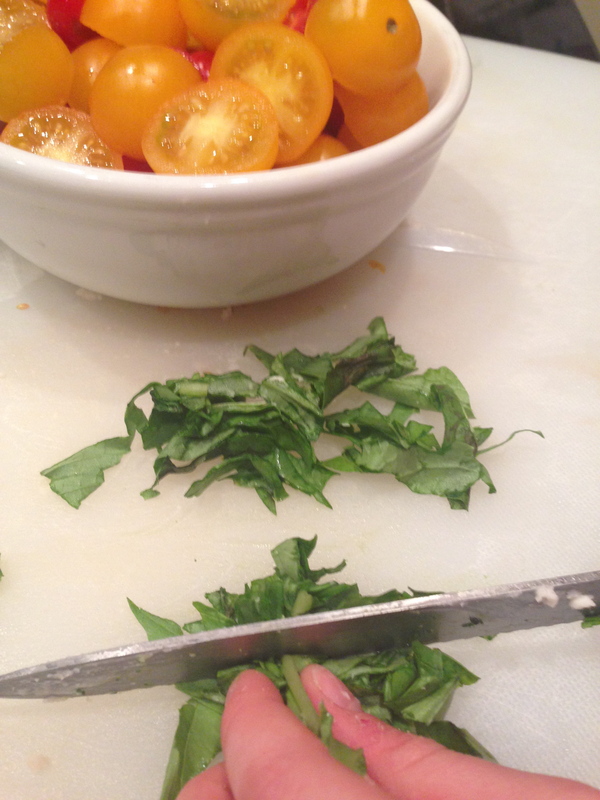 Meanwhile, cut the tomatoes in half, the mozzarella in small cubes, and chop the basil. Toss these ingredients in a bowl. Put half of the tomato mixture in the bottom of a serving bowl. Sprinkle with half of the vinegar and half of the olive oil, and some salt and pepper. Now top with 1/2 of the warm pasta. Repeat this process with the remaining ingredients. Toss to coat everything, adding more vinegar and oil as desired. 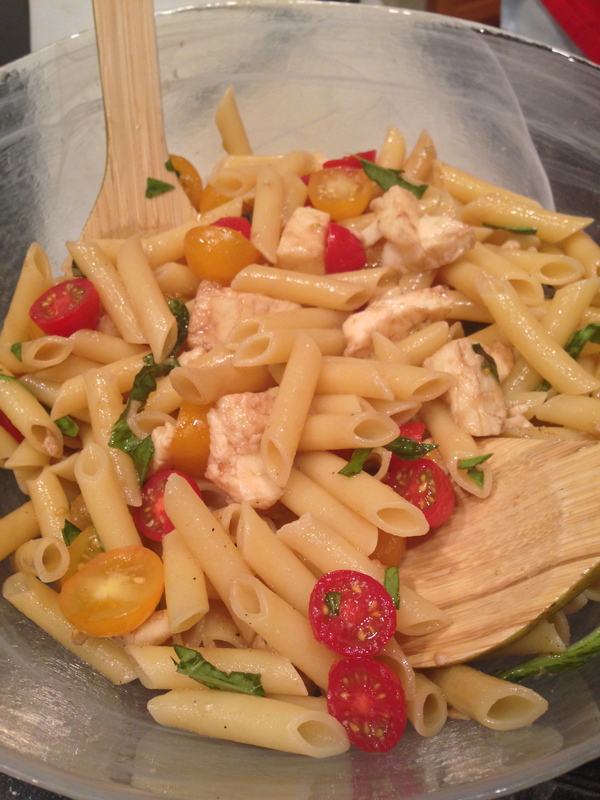 This entry was posted in Main Dishes, Pasta and tagged balsamic vinegar, Caprese Salad, fresh mozzarella, penne pasta. Bookmark the permalink. ← Jambalaya + Kings Cake: It’s Mardi Gras!